Collins was indicted along with his son, Cameron, and Stephen Zarsky, the father of Cameron's fiancée. According to the indictment, Collins was attending the congressional picnic at the White House on June 22, 2017, when he received an email from Innate's CEO, notifying him that a promising drug had failed a clinical trial. Within minutes, Collins telephoned his son, who then passed the information along to others. "The crime that he committed was to tip his son Cameron so that Cameron and a few select others could trade on the news while the investing public remained in the dark," Berman said. "I believe I acted properly and within the law at all times with regard to my affiliation with Innate," Collins told reporters Wednesday night. "The charges that have been levied against me are meritless, and I will mount a vigorous defense in court to clear my name." According to the indictment, the elder Collins was not able to sell his stock because it was held in Australia, where trading had been halted in advance of the company's announcement. Over-the-counter trading continued, however, in the U.S., where Cameron Collins' and Zarky's shares were held. Collins' dealings with Innate Immunotherapeutics are also the subject of an ongoing congressional ethics probe. He had promoted the stock to former Rep. Tom Price, R-Ga. Price's own holdings in the company became an issue when he was nominated to be President Trump's first secretary of health and human services. "While his guilt or innocence is a question for the courts to settle, the allegations against Rep. Collins demand a prompt and thorough investigation by the House Ethics Committee," Ryan said in a statement. "Insider trading is a clear violation of the public trust. Until this matter is settled, Rep. Collins will no longer be serving on the House Energy and Commerce Committee." Collins, who is one of the wealthiest members of Congress, was the first member to publicly endorse Donald Trump during the 2016 presidential campaign. He also served on Trump's transition team. Berman said prosecutors were mindful of the upcoming midterm election but added that did not color the timing of the indictment. Collins' Democratic challenger, Nate McMurray, called the charges "shocking and sad, but not surprising." "Anyone who's been paying attention knows what's going on," McMurray said in a statement. "And now the jig is up, because no matter how this is spun, it's clear that the swamp is alive and well in Washington, DC." "They're either geniuses at the stock market, or they know something that we don't know," said Craig Holman, a lobbyist with Public Citizen's Congress Watch division. In 2012, after a "60 Minutes" expose, Congress passed a law requiring members to disclose their stock trades within 45 days. Since that new transparency standard took effect, Holman said, the volume of trading on the Senate side has declined by more than two-thirds. 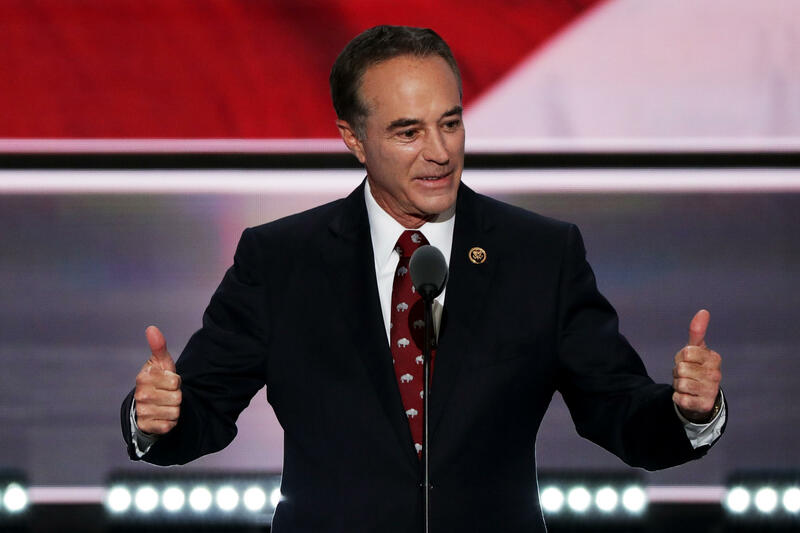 The FBI arrested a New York congressman today on charges related to insider trading. Federal prosecutors say Chris Collins illegally shared inside information about a pharmaceutical company. They say he was trying to help his son and others avoid big losses when the company's signature drug failed a clinical trial. NPR's Scott Horsley reports. SCOTT HORSLEY, BYLINE: Chris Collins, a Republican who represents the suburbs around Buffalo, is one of the wealthiest members in Congress. And for years, he's been a major investor in an Australian biotech firm called Innate Immunotherapeutics. Collins actively promoted the company to friends, family members and fellow members of Congress, including former Health Secretary Tom Price. So it was a shock last summer when Collins got an email from the company's CEO saying a promising drug for multiple sclerosis which was thought to be a blockbuster had failed a clinical trial. Collins, who was attending a White House picnic at the time, quickly wrote back, wow - makes no sense; how are these results even possible? And then, according to U.S. Attorney Geoff Berman, Collins made a fateful phone call to his son Cameron. GEOFF BERMAN: The crime that he committed was to tip his son Cameron so that Cameron and a few select others could trade on the news while the investing public remained in the dark. HORSLEY: Four days later when news of the failed trial became public, the company's stock plunged by 92 percent. But by that time, Cameron Collins and several others he'd alerted had sold their shares, avoiding losses of more than three quarters of a million dollars. The congressman himself was unable to sell since his shares were held in Australia where trading had been temporarily halted. But by tipping off his son, Berman says, Collins cheated both the markets and the justice system. BERMAN: He placed his family and friends above the public good. HORSLEY: Berman says Collins, his son and a third man compounded their crime by lying to investigators. In a news conference this evening, Collins called the charges meritless and promised to wage a vigorous defense in court. CHRIS COLLINS: I believe I acted properly and within the law at all times with regard to my affiliation with Innate. HORSLEY: House Speaker Paul Ryan called for an ethics investigation and temporarily stripped Collins of his seat on the powerful Energy and Commerce Committee. Craig Holman, who's with the watchdog group Public Citizen, says Collins is the first member of Congress to face charges related to insider trading even though lawmakers are privy to all kinds of inside information and have the power to make market-moving decisions. Holman points to an academic study of stock trading by U.S. senators. CRAIG HOLMAN: This study found that senators enjoy a 12 percent higher rate of return on the stock market than the rest of us, which means they're either geniuses at the stock market, or they know something that we don't know. HORSLEY: In 2012 after a "60 Minutes" expose, Congress passed a law requiring members to disclose their stock trades within 45 days. Since that law took effect, Holman says the volume of trading on the Senate side has declined by more than two-thirds. Scott Horsley, NPR News, Washington. Transcript provided by NPR, Copyright NPR.